Remind me why Greece is fun? Where is that leak anyway? 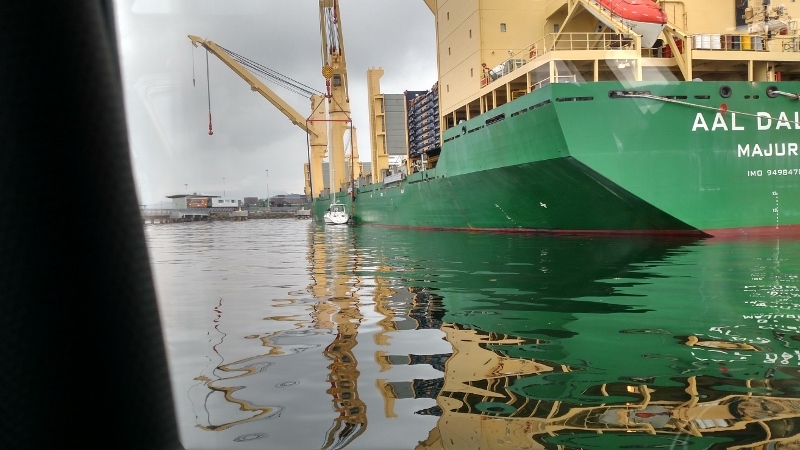 A year ago last May, a lady from Brisbane Australia contacted us about the blog post where we off loaded Apsaras from the AAL Dalian - the ship that had brought her home from Panama. Kaye wanted permission to use one of the photos from that post to make a quilt. Today she sent pictures of the quilt. Absolutely gorgeous! 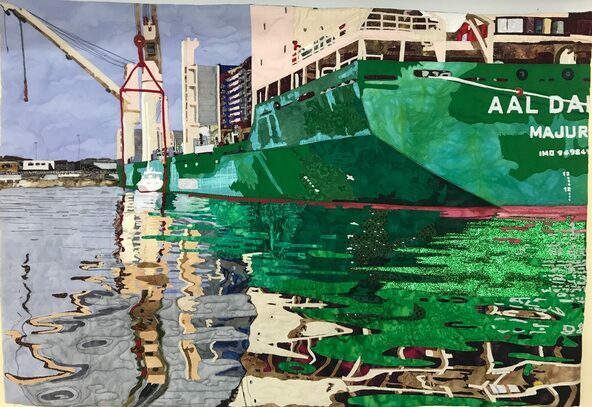 She intends to enter the quilt in her state show - and we are sure hoping she wins - because she surely deserves it! All in all we drove 885 miles across Morocco in two weeks time – seeing everything from the markets in Marrakesh to the dunes of the Sahara Desert. We took 1250 pictures – of which 200 ended up in the blog. Dave had little trouble driving. For us, we enjoy not being on someone else’s time schedule. And Dave has enough experience in close quarter maneuvering, and in the “there are no lanes all the cars go where they want” style of driving in the cities. Generally, the roads were in good condition. And all the road signs are marked in French in addition to Arabic, so you can read the locations and street names with no trouble. 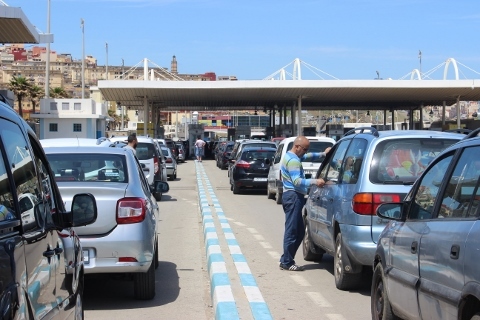 Though whether you choose to rent a car or drive depends greatly on whether you enjoy driving (Dave does) and whether you are comfortable with wandering around a third world country with no interpreter. Did we feel safe? Yep. As safe as most third world countries in Central America. Yes, you need to pay attention to what’s going on around you and go with your gut if something seems amiss. 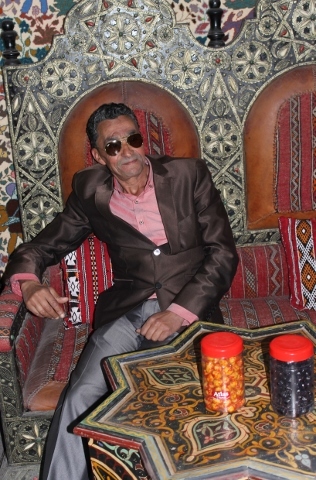 But with few exceptions the Moroccan’s are a warm and welcoming people. Speaking English is no problem – people speak it everywhere. If you have a bit of Spanish or French so much the better, but even without it – in the rare case you step into a shop where the proprietor only speaks French, no worries as the next shop keeper will speak English. We were also pleasantly surprised by how clean a country it is. Rarely did we see the trash along the road side the way you do in places like Mexico. And generally, there were not a lot of bugs, with the exception of the Sahara where the flies drove us nuts. We were surprised as to the number of tourist women not wearing scarves. We had been told that Melissa should don one – particularly outside the main cities. But the truth is that you don’t have to. Its completely your choice. We did find that when Melissa did wear the scarf that we tended to get hassled a bit less by the pressure of shopkeepers trying to get us into their shops and by the “helpful” scam artists in the souks that will try to help you from getting lost. We had our challenges, but for sure we would go back. The only question is whether we would choose a new adventure – Thailand, an African Safari, or New Zealand before making our way back to Morocco. We’ve navigated across Morocco, but can’t navigate to the airport? We awoke at 2:30am, rolled out the door at 3:00am for the drive to the airport. Dave has been babying the clutch for some ways now. So just a few more miles to go. Dave turns on his phone and hands it to Melissa to navigate. She pulls up google maps, and, the phone’s screen gets all snowy and the GPS stops updating our location. Uh oh. Dave’s phone has been slowly dying this whole trip. Almost immediately after we arrived, a vertical line of pixels died. Then a few days later another line. Then last night it got scary hot and Dave shut it down. But we just need it to last another 30 minutes! Alas it doesn’t want to cooperate. No sweat though because Melissa has her phone, right? Wrong. Unlike Dave, she had not pre-downloaded the maps for Morocco. Ok, so now what? Ditch the car and call a cab – telling Hertz later where to go get the car? That’s a pain. Well, the phone screen lasts a few seconds before dying. Maybe we just turn it off and on repeatedly? So that’s what we did. We’d get a few seconds of map, wherein Melissa would tell Dave what the next turn should be, then turn off the phone. Then a minute later turn it back on and see if we had made the turn in the right place. We made about 5 wrong turns this way, but we corrected quickly, and probably only lost about 10 minutes overall. Good thing we planned plenty of time to get to the airport. Upon arriving at the airport, we wonder where the heck to leave the car? Its early so no one is around to check the car in. We spot a Hertz van and leave the car there next to it. We go into the airport and find the Hertz counter and toss the keys along with our rental paperwork over the glass wall and onto the desk. Good as its gonna get. Then off to stand in the check in line. Melissa is hoping to bring back a 10 lb rock filled with fossils that we picked up in our tour around the Sahara. Didn’t cost us anything, but Melissa likes her rock. Unfortunately, the suitcase is overweight, so Melissa moves the rock to her carry on. Alas, security won’t let her have it, so we lost our rock. Dang it. The flight from Tangier to Lisbon is an hour late, but no sweat as the layover in Lisbon is scheduled at 5 hours. We get to Lisbon and its time for breakfast. But with all the food allergies, and with Dave being sick as a dog, there is almost nothing we can eat. Melissa buys some grapes and some prosciutto and chomps them down. Then we board the flight for Washington Dulles, with a hour and half layover, onto Seattle. Uneventful but very, very long day. We arrive home at 9:00pm, a mere 26 hours after departing our hotel, and 27 hours with little to no sleep. Yawn. We awoke to a cold blustery morning. We ate breakfast and then headed back to the room to read for a while. Dave isn’t feeling well, so Melissa heads out to souks again on her own. Today’s mission was to find some jars in which to put olives to take home. In the souks two little girls ask Melissa to take their picture. “No dirhams! No money!” she says. Their Dad who is nearby chuckles. “No money”, he confirms. So she snaps a few pictures and the girls giggle when they see the pictures. She wanders around a while, but alas doesn’t spot a kitchen store where she can buy jars. We’d been told if you get lost or have a question in the souks, you should ask a shop keeper. Melissa finally relents and asks someone if they know a kitchen store. The guy she asks jumps up and says “I’ll show you”. Oh boy, here we go, and she inwardly rolls her eyes. 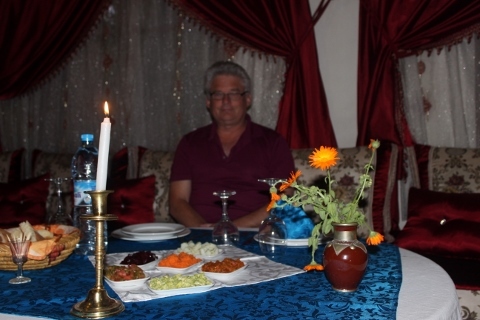 Aziz was his name, and he had a friend with a kitchen store he tells her. Uh huh. Melisa follows him down and around the narrow streets. Eventually we get to his friend’s store, but its closed. Not to be defeated, Aziz heads off continuing the hunt. He finds a store, and Melissa buys two jars. 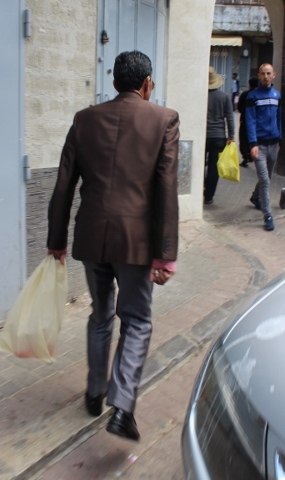 Aziz grabs the bag and heads off to find the olives. Aziz is telling her that after we find the olives, she must join him at his place for a cup of mint tea. Now, Melissa knows this is a game. And the name of the game is help the tourist so they feel guilty and buy something from you. But as she really has not a lot to do, and Aziz is such a character, she decides to see how this plays out. She’s in no danger, and all he’s got in his hand is $2 worth of jars. So easy to walk away if she gets uncomfortable. 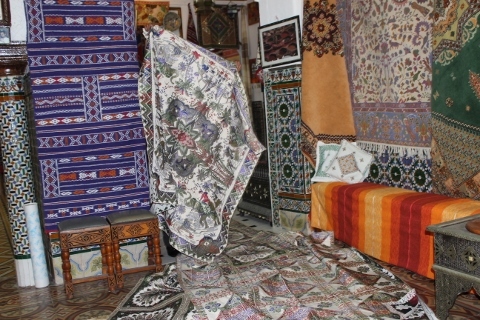 At one point he says she must join him at his shop as he has something to show her that you can’t find anywhere else in Morocco. Says something about flower buds. Hmmm. Oh please not let it be marijuana or some crazy thing! We find Aziz’s favorite olive vendor and after a quick tasting, Melissa buys the two jars worth of olives, though not till Aziz gets the vendor to wash out the jars first. We get back to Aziz’s shop and Melissa snaps a picture. He looks part mob gangster in his silk suit. Then after getting her cup of mint tea, out come the rugs! Melisa explains she has no where to put the rug in her house. No problem says Aziz, you can hang them on the wall! She laughs and shakes her head, no, no, the only thing I can take home must fit in the suitcase! No problem says Aziz, we can ship! An answer for everything! Then he takes out his book to show her all his “friends” in the USA. This turns out to be his sales book showing all the customers he has shipped to all over the world. “Maybe you find someone you know?”, he says hopefully. Like this is supposed to gain him credibility. After choosing one very small door mat sized rug and one very small table top piece, the negotiations begin. 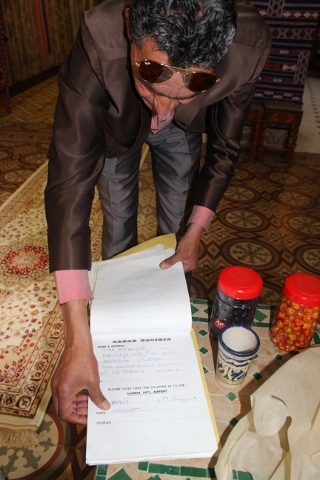 Aziz starts at $250 US dollars – writing it down on a piece of paper. Melissa laughs. Um, no way. She writes $80. Aziz writes $230. Melissa laughs again. Aziz writes $210. Melissa laughs some more. Aziz comes down to $180. Melissa writes $100. Aziz comes down to $150. Melissa comes up to $120, and Aziz agrees to that. Probably still too high, but every time she sees that rug she is going to laugh and remember what a character Aziz was. Then back downstairs to the bottom half of the shop where there are more trinkets. Melissa picks up a couple of cups, olive plates, and yet one more scarf. They pack all her wares up in wrapping to make packing in the suitcase easy. Aziz suggests that Melissa take $2 (the $20 dirham note that they gave her in change) and give it to the guy packing the wares. Why not? Then she was off to find a taxi as no way is she lugging all this stuff all the way back up to the top of the hill. She heads for the same taxi stand she used yesterday and asks how much to get back to our hotel. $3 the cab driver says. No way! Melissa shakes her head and says $2, because that’s what she paid yesterday. The cab driver relents, ok.
Then it was time for one last Hammam before departing tomorrow. Dave was still sick so he skipped it, but Melissa was feeling nice and relaxed by the time dinner rolled around. We elected to have dinner at the hotel as our flight is at 5:30 am, which means an alarm clock going off at 2:30am. The hotel set us up with a sweet little romantic table for two. 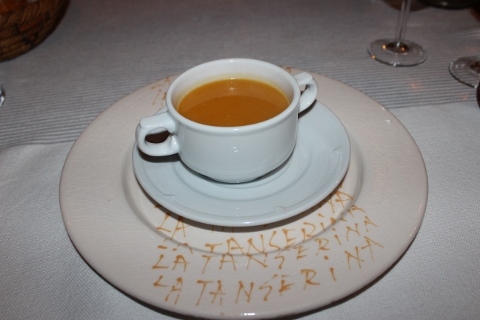 The soup tasted like pumpkin. Then they served lamb with prunes, and the usual assortment of salads. We had hoped to escape before they feed us some desert. But no such luck – the brought it up to our room! Whew! We made it back to Morocco! We awoke at 6:40am and decide to get moving. After a quick shower, Melissa puts on her watch which now says 6:00am. What the heck? Immediately she realized that our phones had automatically switched to the time in Spain (1 hour later) because they locked onto the Spanish cell network. So it was an hour earlier than we thought. That probably turned out to be fortuitous. 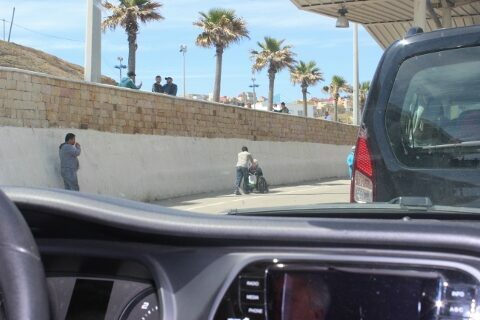 Back in the car we find the Moroccans are already pouring into Ceuta. We get to the boarder and are the second car in line! Whoo hooo! 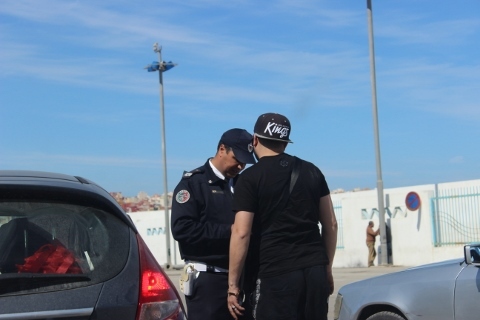 Despite this, it still took us nearly 30 minutes to get through because the one and only Moroccan immigration officer was handling two car lanes, plus pedestrians who were crowded around the booth yelling at him. He was yelling back that they had to wait their turn. Meanwhile we sat shaking our heads at the craziness. The same guys were there doing the fence jumping bit already. Whew! Its 7am and we are back in Morocco! We looked back to see that cars were already piling up. We made the hour and a half drive and found our hotel. We had called them last night to let them know we wouldn’t arrive till the next day. 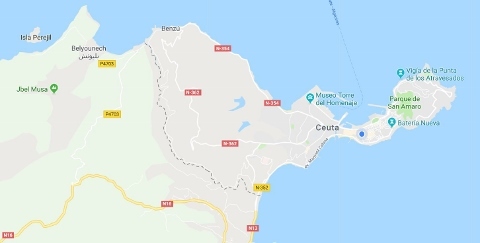 As they welcomed us in, we told them we had gotten stuck in Ceuta, and they said that they used to go all the time and shop, but that its gotten so crazy they would rather pay the higher prices for things than take the time. 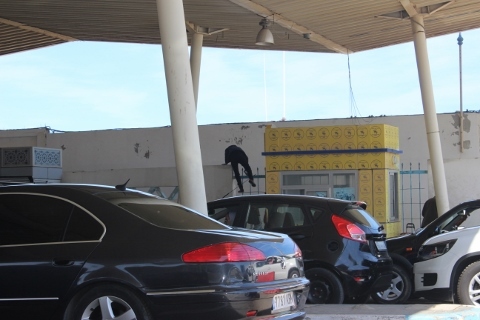 Once they had to overnight in their car because sometimes the Moroccans close the boarder back at night. The view from the deck at La Tangerina is gorgeous. 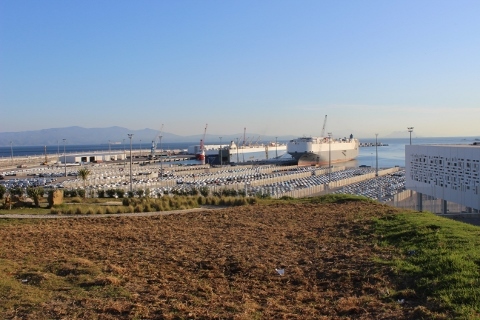 And ironically is what we imagined we might find in Ceuta looking out over the Mediterranean Sea. We sat and had a nice breakfast. And the view from the private little deck off our room has a view of the city. For lunch we wander out and find a restaurant overlooking the city and beach. We noticed that the prices were like being back in the US – it was nearly $50 US Dollars for lunch – three courses each, but still. 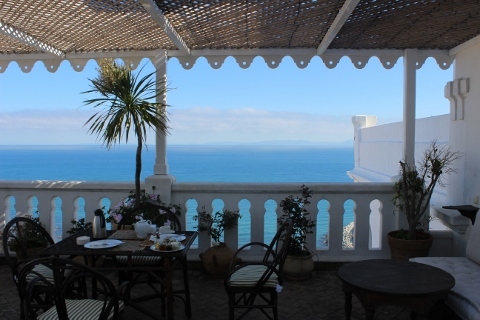 We mentioned that it seemed like Tangier was more expensive than other places in Morocco to the owner back at the hotel, and she asked where we had gone. She rolled her eyes. “That place is a scam!” Apparently there is a kick back to the tour guides who bring tourists in for lunch. No surprise as we saw all the tour guides sitting around the restaurant lobby eating when we came in. Oh well. We did enjoy the view. 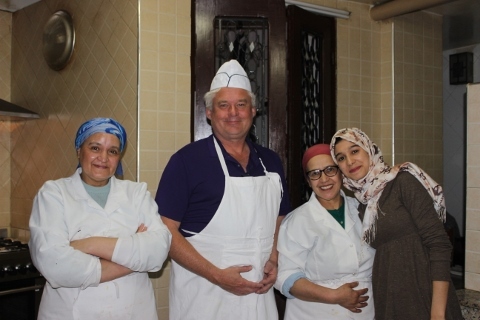 We made reservations for dinner at the Morocco Club – Trip Advisor said it was #3 out of 200 restaurants in Tangier and it was next door to our hotel – so we couldn’t resist. But we had not brought any clothes for a fancy restaurant, so Melissa heads out to do a little shopping. In the square next to the hotel she finds a designer clothing shop – one of a kind pieces that are handmade, and buys a dress and a lace shawl. Both exquisite. Hard to tell from the picture – but the dress is made from a ton of scarf like pieces that all drape. She walks down to the next scarf shop and picks out another 4 scarves. This vendor having watched the prior exchange offers them for $35. But these are not silk. So not worth as much. Melissa offers $20. He says $30. She says $25. Sold. Ok, might be getting the hang of this haggling thing. She heads out and the third scarf vendor who had been watching comes running up and says, “you must come to my shop next!” Melissa heads over, but the types of scarves he is selling are not the type she wants, so she heads out. He chases her out the door complaining that she bought from the other two but not from him, and how its not fair. She just keeps walking and says he doesn’t have what she is looking for. By now she has wandered so far that she has no idea how to get back to the hotel. No sweat. 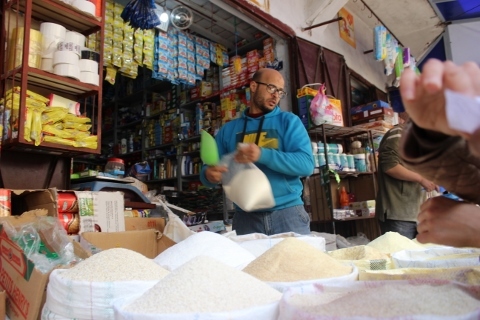 The markets in Morocco are all made up of winding twisty tiny alleys and its near to impossible to keep track of where you are if you are not a local. But there just isn’t a reason to even try – because if you just keep walking eventually you make it to a main entrance where there are a line of taxis. So when she finds the taxi line, she asks how much and the answer was $2 to get back to the hotel. Easy peazy. The rest of the afternoon we hung out on the hotel deck and watched the sunset sipping some nice rose wine. We engaged the owner of the hotel in an interesting conversation about the wine. We commented how we were surprised to find wines here that are really very good – given this is a Muslim country where the population doesn’t drink. She laughed. “Oh, no, this is the perception, but the reality is very different.” She went on to explain that technically it is illegal to sell alcohol to a Muslim. And you are Muslim if you are born to a father of a Muslim – whether you practice the religion or not. Her husband who is European, had to convert to Muslim to marry her in Morocco. And hence their children are Muslim regardless of their beliefs. 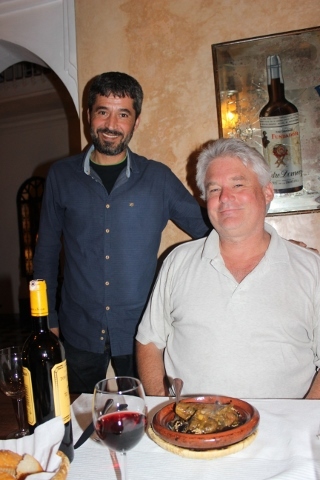 But if you go down to the Tapas restaurants on the beach that serve wine – the majority you see there are locals. So the notion that the local population doesn’t drink is not accurate. Fascinating. Then we headed out to dinner. And sure enough, the food was fabulous. 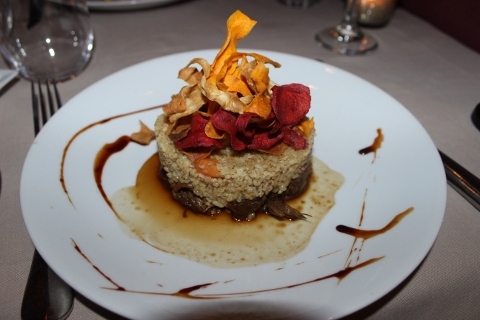 They had a lamb and barley couscous. Melissa has been bummed not to be able to eat couscous while we are here. But she can eat barley! She askes the waiter if the couscous is really barley without any wheat. And he askes her if her issue is gluten or a food allergy. Melissa’s jaw dropped open. 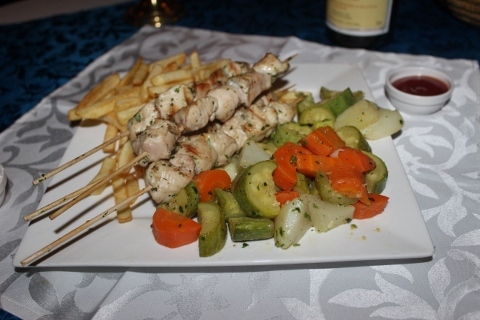 There are very few waiters in the US who understand the difference, and here in morocco – food allergies are unknown. We’ve been told there isn’t even a word for it in Arabic because no one here has any food allergies. (Begs the question of why!) But regardless, to find a waiter who knew to ask because barley does have gluten in it was a total shocker. The dish showed up and was amazing! 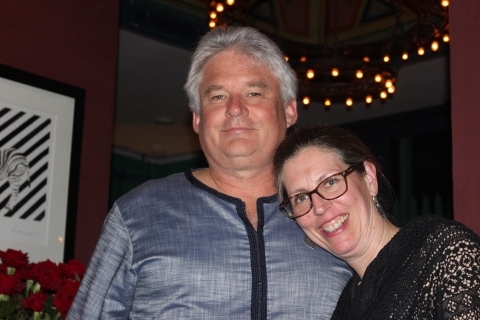 Melissa also bought Dave a nice Moroccan shirt to wear. Fun! How about tapas for lunch? We realized last night that because Ahlam asked us to pay the bill last night, they missed charging us for the bottle of wine at dinner. So Melissa took another $20 US dollars down to the front desk. We continue to be amazed at how cheap food is here – a good bottle of wine in a restaurant back home would be twice that. At breakfast they brought us a local dish – not normally on the menu. Some meat (the waiter said bacon – but it wasn’t bacon – more like shredded beef maybe?) 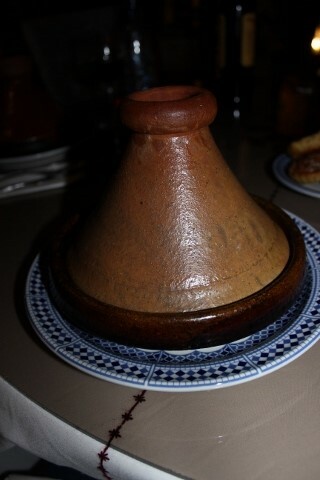 in a tagine, with two eggs cracked over the meat and cooked up nice and hot. Yum. Then there was more of the chickpea bread and the rice cakes the cooks made special for us. There was also carrot and grapefruit jelly. Both of which were delicious. Might be worth trying to find a recipe for the carrot jelly – very unusual (well to us anyway). The kitchen packed up all the breads they had made for us without wheat in a box with a bow. So sweet of them! 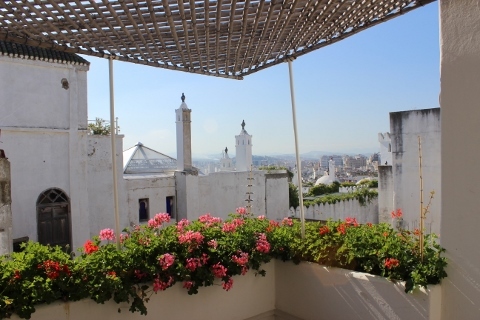 Then we packed up and headed north – our destination today was Tangiers, by way of Chefchaouen– the blue city. The countryside is beautiful – all green and lush farm land. Scenes like this one are typical. 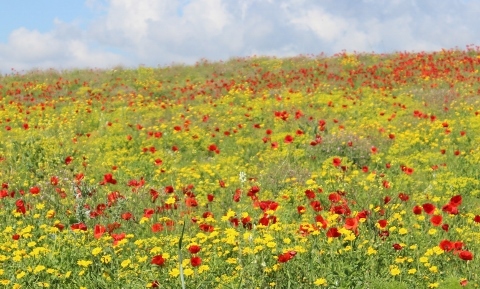 Because it is spring, there are wild flowers everywhere. 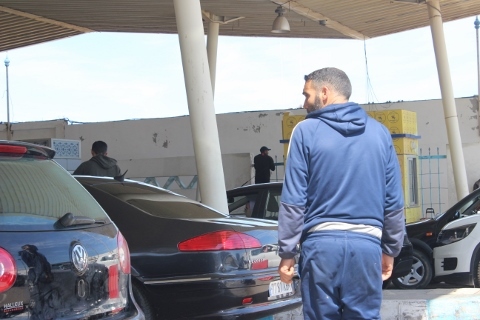 Its common here to run into police check points every hour or so – more often near the cities. Usually they just wave us through. But one today they waved us over and asked for our papers. We were a bit puzzled as we hadn’t passed anyone, and Dave has been meticulous about obeying the speed limit as we had been warned earlier about that. Alas, apparently as he crested a hill, he was a tad over – 67 in a 60 kph zone. Basically that’s 40 in a 35 mph zone back home. 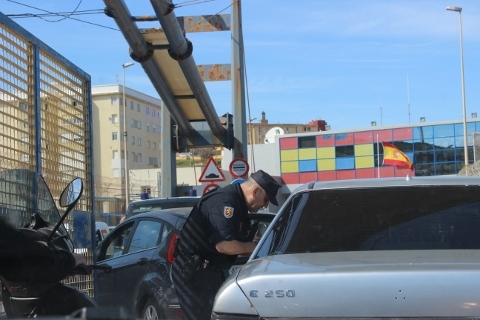 Apparently, there must be a zero-tolerance policy on speeding as the police officer was quite apologetic about having to write him the ticket. Cost us $15 US dollars. Oh well. 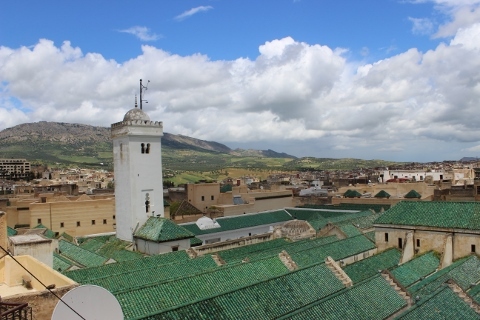 Then we round a corner to find Chefchaouen – known as the blue city as by decree people can only paint buildings blue or white. We had planned to have lunch there – but when we drove through the city it was a bit of a zoo, and we weren’t really hungry yet so we kept driving. 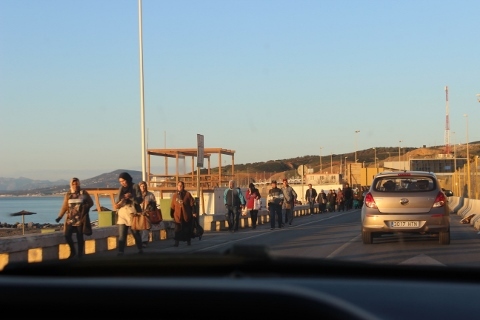 We get to the boarder, and we see a very long line of Moroccan’s standing in a line that has to be a quarter mile long. Hmmm. That’s odd. We press on to the boarder and get in line. Well, doesn’t look so bad. Maybe 10 cars in front of us. Imagining this like the Canadian border we are like hey – we should clear this in 20 minutes or so. Then we realize that the cars don’t move very often or very much. Everyone has turned off their engines. And we begin to notice strange goings on. 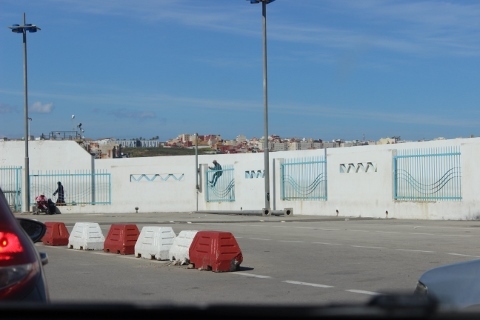 The wall in this picture separates the lanes going into Spain and the lanes going into Morocco in the other direction. People are constantly jumping over this wall. They call each other on their cell phones to meet up and then have secret little conversations with one another. And while there is a walk way for pedestrians on our left, there are just people everywhere. Several wheelchairs get pushed by the cars. And people wait till the guards aren’t looking and jump the fence from the car lanes to the pedestrian lane. In this picture you see the guy in the foreground watching for the guards before he makes a run for it like the guy in the background who is climbing the fence. Sometimes these guys go talk to the officers. Sometimes the officers wave them away and send them out, and sometimes they seem to chat a while and let them through. It takes an hour to get through the car line you saw in the first picture. But this is just to get checked out of Morocco. Its another hour to sit in line for immigration into Spain. Yet more fence jumping in the waiting area between. At this point, car driver swapping begins. Two of the guys who have been fence jumping and running all around are now in the car in front of us. And then a bit later, they swap drivers again. Finally we get our passports stamped by Spain and figure we are home free. But no. Now its time for the car searching to begin. They turned one car in front of us around at this point and sent them back to Morocco. Why we don’t know because the people in that car were not involved in any of the shenanigans. And the car directly in front got through. Melissa got yelled at by the guards for taking this photo. Despite that (and to our later disappointment) they let us through. Finally two hours after getting in line, we are through the checkpoint. There is a mass of people on the far side. And we realize that the line to get back to Morocco is long. How long you ask? 1.25 miles long – all the cars in a single file. So that’s over 300 cars. Oh no! It might be days before we can get out of here! 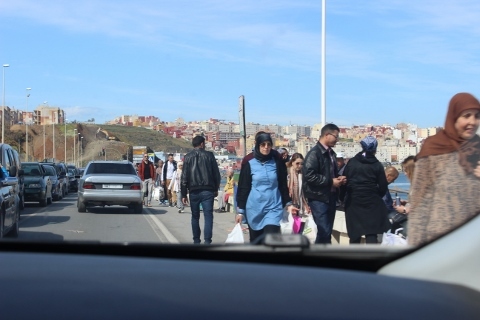 Though the reason for the craziness becomes somewhat clear – all the Moroccans headed the other direction are carrying shopping bags. 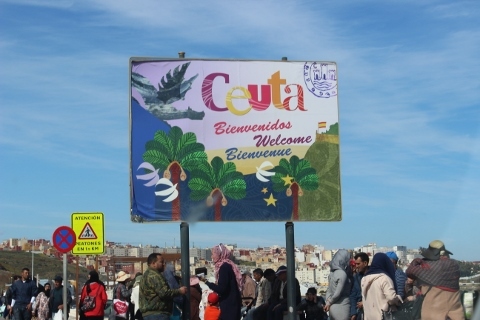 We later learn that Ceuta is a tax free zone – so things are very inexpensive here. Like a liter of gin or vodka for $11 Euros ($13 US dollars). 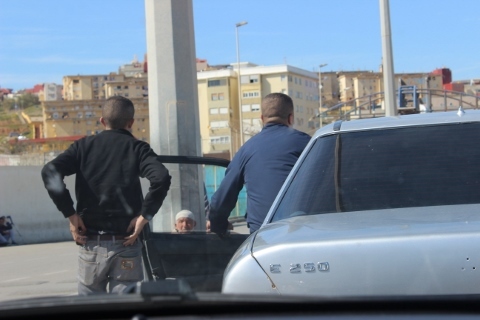 So they come here not to try and immigrate to escape Morocco – but to shop! Well, might as well drive around and see the sites. So we go for a drive around the point. The city itself is sort of pretty. But there are no seaside cafes. Not a single one. The view from the furthest end point is gorgeous though. Our first view of the Rock of Gibraltar! Ok, so now that we have seen the sites, now what? Oh hey! Now that we are in Spain, data works on our phones! So Melissa pulls up TripAdvisor and looks to see if there are any hotels available. Because maybe we would be better off staying the night here and trying to cross the boarder in the morning. We figure that the shopping crazy Moroccans probably won’t have bought all their stuff really early in the morning, and maybe the line will be shorter. 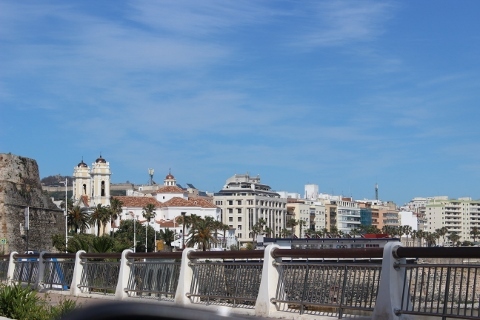 Add to that its now 6pm and it will be dark in a few hours and we don’t really want to make the hour long drive to Tangier in the dark along the winding twisty road down the coast. Sure enough Trip Advisor shows several nice hotels with availability for about $100 US dollars a night. Ok, so maybe the thing to do is go get some local advice about whether the line will indeed be shorter come morning. Because if not, we might be better off getting in line now – if in fact the line is more than a day long to get back out. We find a spot to park the car and get out and start walking. In the center of the city the main street is closed to cars because there are so many pedestrians walking up and down what looks like a mall filled with electronics shops, clothing shops, you name it. We come upon one of the hotels that was recommended by Trip Advisor and pop into the lobby. We ask the receptionist, and she confirms that between 6 and 8 am the boarder should be easier to cross. She tells us she only has a suite available tonight though. How much, we ask, figuring on a ridiculous price. But no, she says that we can have it for $100 US dollars. SOLD! Back to the car. We need to move the car to the parking lot nearest the hotel. The receptionist has given us a map. Alas, Melissa got completely turned around and couldn’t navigate the winding little streets. MacGyver who had just taken one glance at the map navigates to the parking lot without making a single wrong turn. We check in and go up to our room. Key doesn’t work. Back down to the front desk. They assure us its fixed. We go back up and – nope still not working. Back down again. This time someone comes with us and opens the door with their own key. Ok, if this is a suite, I would hate to have seen the regular room. The room is 10 foot x 10 foot with two twin beds pushed together. Oh well, beggars can’t be choosers! After sitting and getting an internet fix, we head off to dinner. Melissa had picked a restaurant off Trip Advisor. She says we leave the hotel and make two rights and the restaurant should be right there. Dave says are you sure it isn’t two lefts? Melissa shows him the map – nope – should be two right turns, see? 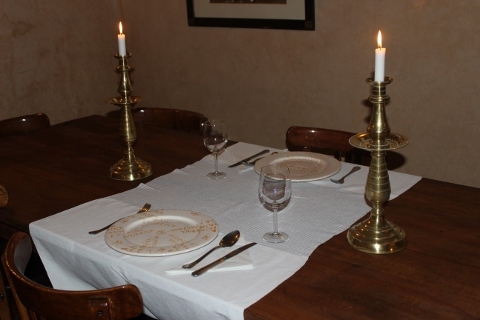 We head off – alas no restaurant where it should be. Hmmmm. So we decide to just walk a few blocks around. The other side of the hotel (would have been two left turns instead of right) we find the restaurant. Upon reflection, where the map showed the hotel entrance was on the wrong side of the street. Why does Melissa ever doubt MacGyver? We go in the restaurant only to discover the noise level is so high we can’t hear each other without yelling. Ok, scratch that. We walk down another block and find a nice little restaurant. We sit down and they ask us what we want to drink and we say (because we can practice our Spanish here!) “Vino Tinto”. And two glasses of red wine appear in under 2 minutes. Ok, we’ve been enjoying Morocco to be sure, but sometimes Europe is nice too. We thought it was a tapas restaurant so we start by ordering three dishes – tuna, pork, and asparagus. We realize our mistake when the tuna and pork show up and its like two pounds of meat. Oh well. It was yummy. We head to bed and hope that the line to get back to Morocco doesn’t take all day tomorrow! 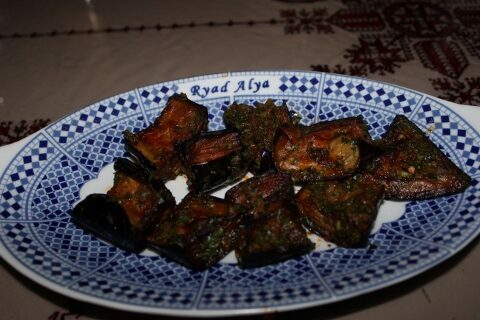 We continue to be delighted with Riad Alya. Here is a photo of the living room downstairs. 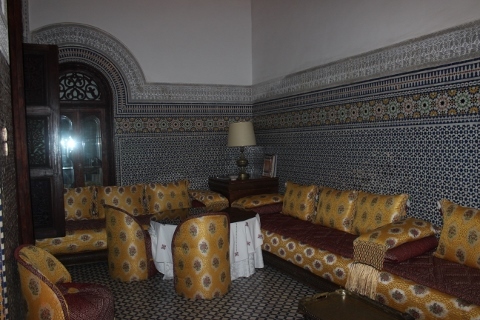 The detailed tiles on the wall are original from when the Riad was built nearly 200 years ago. And the plaster work in the garden area is exquisite. Ahlam explained today that the way this is done is that they put the plaster material on the wall and let it dry a bit. Then they carve the plaster with small tools to get the detail. 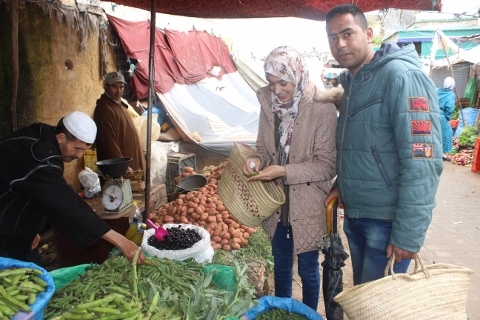 After breakfast Ahlam and Idriss took us to the market. Melissa has a cooking lesson this afternoon, and the plan is to shop and buy all the things we need. Along the way we discussed with them whether the locals also shop in the Souks. 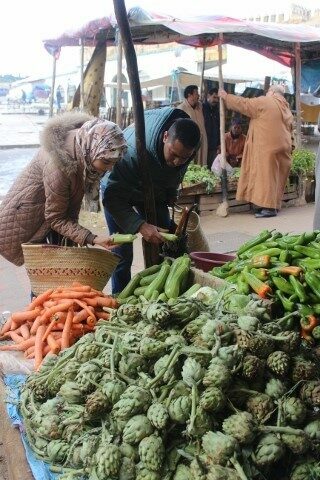 She explained that yes, they have supermarkets here, but they like to buy fresh produce and meats in the Souks. They have vendors that they typically buy from regularly, but if the quality isn’t there or those vendors raise the prices then they will go elsewhere. Because Ramadan is approaching, prices are a little higher than normal. But still the prices of produce are 1/10th of what we would pay in the US. 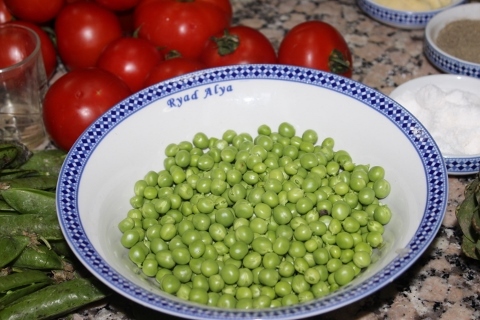 The peas we bought yesterday – 2 lbs for 50 cents is typical. Bananas, artichokes, eggplant – all were typically 2 lbs for less than a dollar. When we told them what we pay they were aghast. Until we explained that everything is higher – including minimum wage at $15/hr – which would be a day’s wages here. While in the market, a local asked to take a picture of Melissa, and she agreed. Melissa later asked Ahlam why he wanted the picture of her, and she said it was probably so he could go home and show his wife a picture of the woman who came to shop from him today. Guess the produce vendors don't get a lot of tourist shoppers. 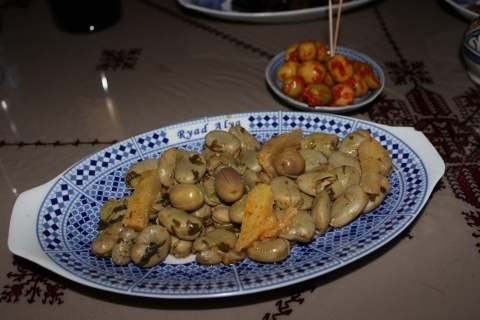 When Ahlam heard Melissa had never cooked fava beans – that had to go on the menu! 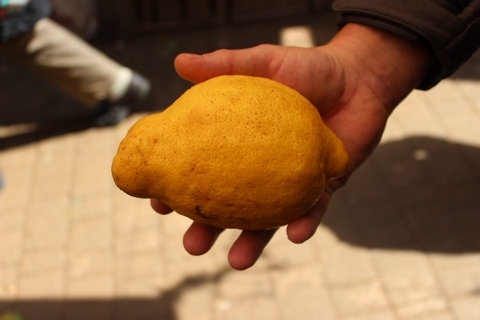 The lemons here are enormous. And the oranges are tasty. 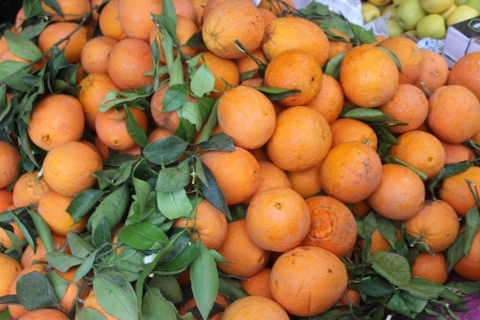 The fresh orange juice they make from them is thick and the best we have ever had. They sell everything in the market. 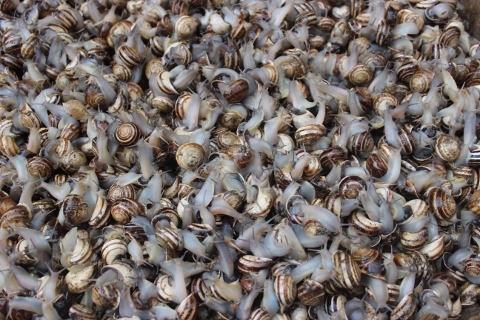 We found a giant cart full of snails. 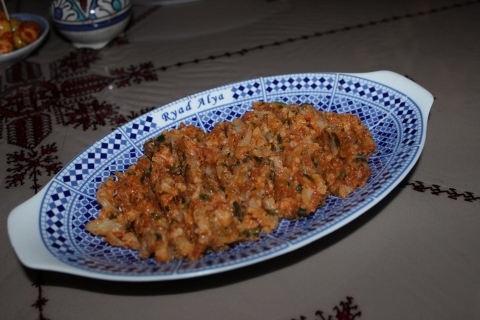 When Ahlam heard another Riad had made us bread from rice, she got all excited. So we stopped to buy rice flour, and flour made from chick peas. Later that afternoon, the kitchen cooks showed us that they had made these small breads from chick pea flour, yeast, and salt. They were very good. 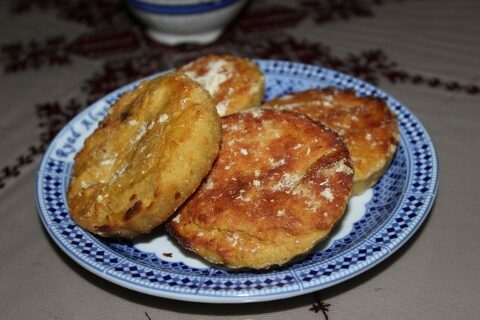 Tomorrow we will get the little rice flour cakes with breakfast. Then it was onto the meat markets. This guy was a character and said that he wanted to make us a gift of a sheep head. Apparently, they eat them here. 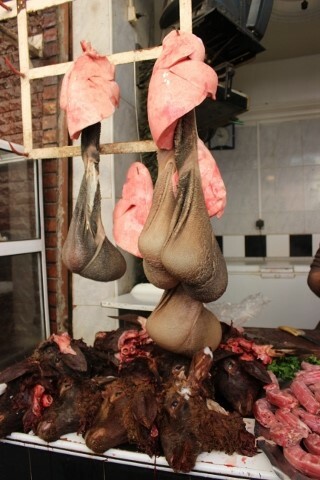 Along with the lungs you see hanging, and the stomachs. Ok, not exactly appetizing for us. 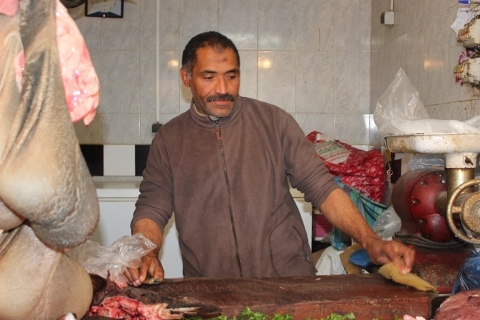 Then it was onto another meat vendor to get the lamb for the tagine. 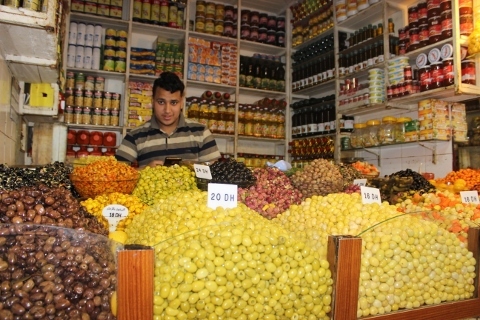 After that Ahlam and Idriss helped us to buy some dates to take home so we would get a good price. 2 lbs for $15 US dollars. Then Ahlam and Idriss headed back to the riad while we went to visit the tannery. As you walk into the tannery, a guide starts to explain how the tannery works. 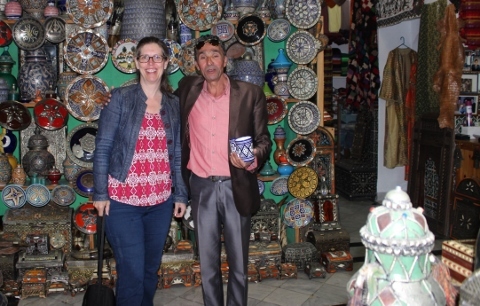 We were sort of blowing him off because we are so accustomed to ignoring the scam artists in the souks that we didn’t realize his real purpose is to help you shop for leather goods when you are done viewing the tannery. Our guy turned out to be pretty helpful, so after seeing the tannery in action, we followed him into the huge shop on the three floors below. We’ve never seen so much leather in one place. 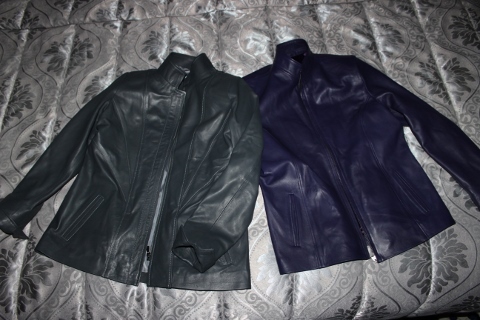 And the number of leather jackets in various styles and colors was staggering. 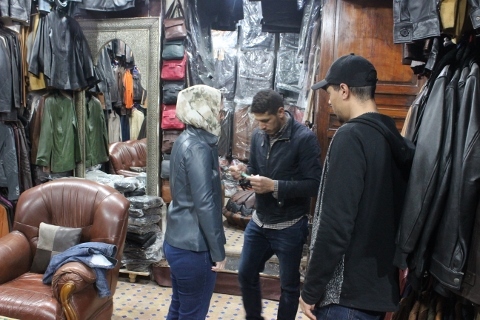 Melissa had considered whether to buy a leather jacket here in Fes – where the largest tannery is – and the best prices can be negotiated. So we looked around a while. And sure enough, Melissa found a couple of coats the style of which she liked. But one was in the wrong color and the other was the wrong size. They insisted that they could make them to order in a matter of hours. So we negotiated them down from $500 each to $300 each and they promised to have them delivered to our riad by 6pm – despite it being almost 2pm by then. They took a credit card, so we figured that if they didn’t show up, we could cancel the charges. And they promised if that when they were delivered we didn’t like them, they would give us our money back. But as promised – though it was 7pm not 6pm – Omar showed up with two jackets that fit Melissa like a glove. Amazing. Then we needed a bit of lunch. So we figured we would find a restaurant in the souks and get something quick before we headed back for the cooking lesson. 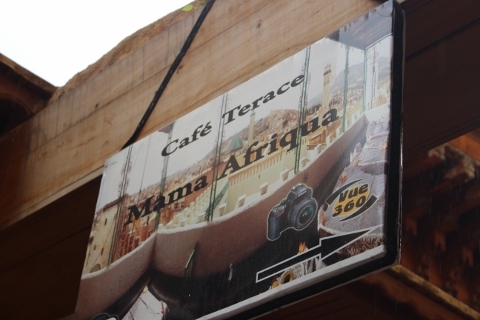 We spotted this sign, and the thought of a view over the souks sounded good. We went up and sure enough the view was pretty good. Alas, we made (yet another) rookie mistake and forgot to negotiate the price in advance. So one serving of meat kababs along with the usual assortment of salads and a bottle of water cost us $12 US dollars. It should have been about $7. 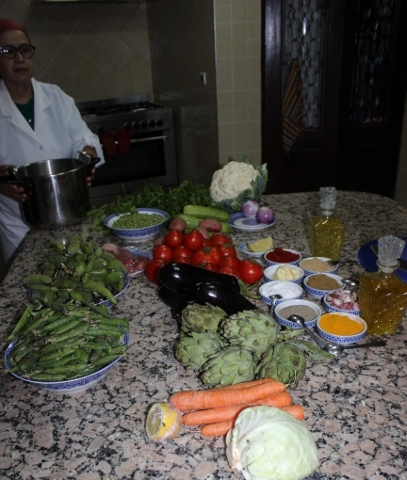 Then we headed back to the riad for our cooking lesson. 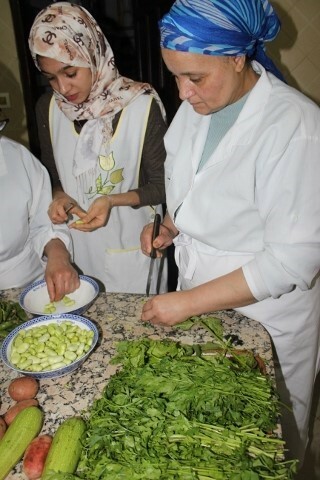 Both the breakfast cook - Amima, and the dinner cook – Fatima were there to help us cook. That’s Amima on the left and Fatima on the right, with Ahlam and Melissa in the middle. When Melissa arrived, the gals had already washed all the produce and set out all the ingredients. Then for the next two hours the ladies cooked. They were cooking so many dishes that Melissa spent the whole time just taking notes and pictures so that she would know exactly how to reproduce the recipes again. At one point, Melissa was repeating back directions that Ahlam had translated from Amimi. Amimi was listening and nodding. Melissa realized that Amimi can at least understand English. Then we had an interesting conversation about salt. They warned Melissa that she wouldn't need so much salt because our salt is much denser and finer than what they use. Melissa looks closely at the salt, and turns to Amimi and says "sal de mer? ", and she nods her head "YES!" After which Amimi begins to converse a bit more with Melissa in English. Turns out she speaks it quite well. Near the end, Dave came down to visit and they made him an honorary member of the team. And the ladies made a gift of packets of all the spices we used today! All the recipes we cooked are in a separate blog post here. All were amazingly delicious and Melissa will for sure make them again at home. This whole day's adventure to the souks to find ingredients and the cooking class were $32 US Dollars. Seriously, I would have been happy to pay three times that. Here are all the salads we made, and the chick pea bread – when they served them to us at dinner. 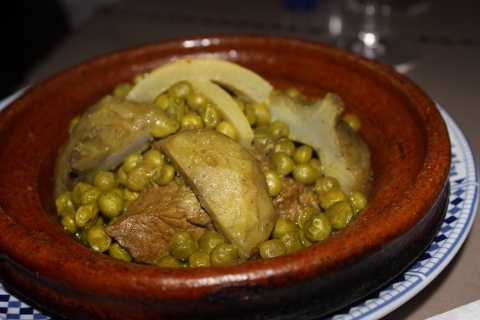 And sure enough, despite the tagine having been made in a pressure cooker, they transferred it to the tagine pot to serve it to us. 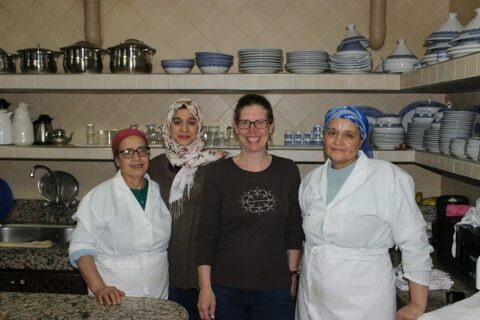 While in Morocco at Riad Alya, we took a cooking class, going in the morning to the market to buy the supplies and then later cooking in their kitchen. To read about the full experience, see this blog post. The receipes and instructions are here. Put lamb in pressure cooker. Grate onions into pot with lamb. Add spices and 1 cup water. Bring to boil and brown the meat a bit. Add another 4 cups of water. Put lid on pressure cooker and cook for 45 minutes. Check to see if lamb is falling apart, if not, keep cooking another 15 minutes and check again. Meanwhile, shell the peas if using fresh. Trim artichokes down to the heart and rub lemon all over to coat them in lemon juice. When lamb is done, add artichokes, peas, and sprigs of parsley. Put pressure cooker back on for 15 minutes. Check to see that peas and artichokes are done, and if not cook a bit longer. When near time to serve, heat up tagine, and put lamb in. Garnish with preserved lemon. 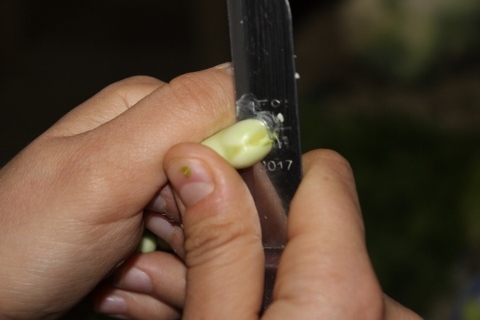 Take fava beans out of pods, remove the head with a small knife, and cut a slit through the bean at the head. Wash the beans. Grate or finely chop the garlic. Put in pressure cooker with 4 cups water. Bring to boil. Add beans. Bring back to boil. Cut preserved lemon in half. Add to pot. Put lid on pressure cooker and cook 10 minutes till beans are tender. Add remaining ingredients to pot. Put pot back on stove and cook till liquid evaporates. Serve on platter with preserved lemon chunks. Wash peas. Chop onion. 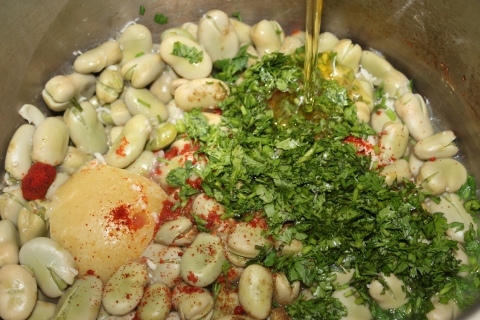 Put everything except olive oil in a pressure cooker with 4 cups water. Cook for 30 minutes. Put mixture through a fine sieve or process in your Cuisinart till smooth. Add water to get desired consistency, and salt to taste. Serve with olive oil drizzled over the soup. 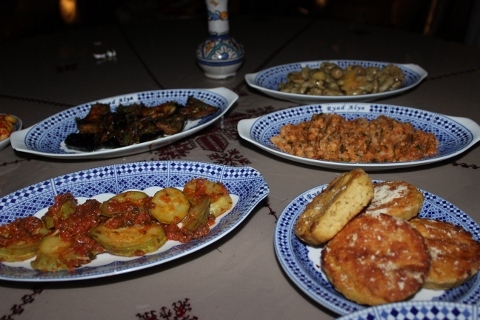 NOTE: Fermented butter, known as Smen, is an essential ingredient to a lot of Moroccan cooking. You can buy it, but you can also make it. Take 2 lbs unsalted butter and mix in 2 Tablespoons salt. Let sit overnight and pour off all the water that the salt extracts. Then mix again, cover, and leave in a dark place for 1 month. Here is another recipe that adds a bit of oregano. Slice zucchini on an angle to get large slices about ½ inch thick. Put in pot. Cut tomatoes in half, and grate into pot, discarding the skins. Finely chop or grate the garlic and add to pot. Add remaining ingredients except vinegar. Add water till covered. 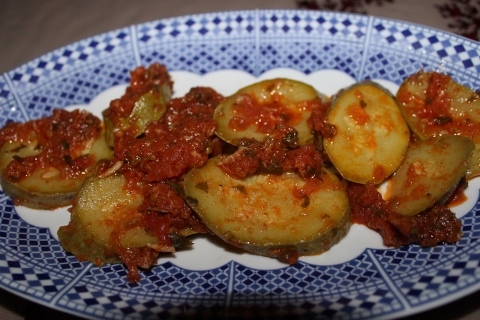 Cook till zucchini is very tender. Add vinegar. Continue to cook till all water is evaporated and you have a nice tomato sauce coating the zucchini. Cut cauliflower into medium sized florets. Put in pot covered with water and bring to boil. Boil till very tender. Drain. Meanwhile, cut the tomatoes in half and grate them – discarding the skins. (See video in Zucchini Salad recipe.) Grate or finely chop the garlic. 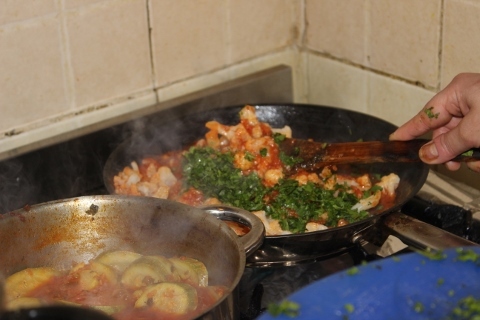 Put tomatoes, garlic, paprika, cumin, pepper, salt, and olive oil into a large frying pan. Cook over medium high heat till all the water is gone and you have a thick tomato sauce. Add cauliflower to pan and mix, smashing the cauliflower as you go. Add cilantro and mix in well. Put 1 tablespoon of green tea and 5 mint leaves in small tea pot. Add a lump of sugar if desired. Fill pot with hot water and put on stove and boil a few minutes. Serve! Cut eggplant into 2-3 inch chunks. Put ½ inch oil in large frying pan. 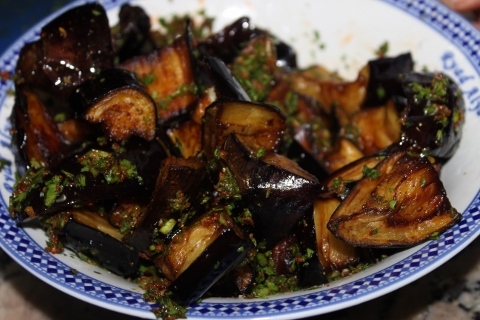 Add eggplant to pan (you may need to do this in two batches depending on the size of the pan. 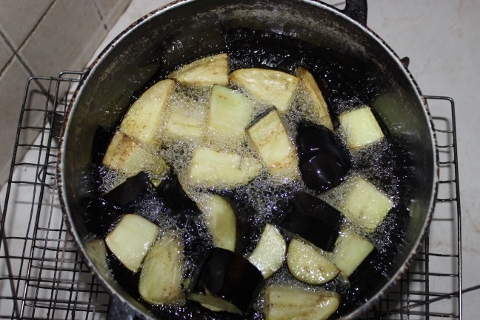 Fry eggplant till deep brown in color. Scoop out of pan with a slotted spoon into a bowl. Don’t drain on paper towels as you want some oil. Meanwhile, chop parsley and cilantro together. Finely chop garlic. Add all remaining ingredients to a bowl with the garlic and chopped herbs. Add eggplant to spices along with residual oil. Mix. This can be served in a couple of hours, but is better left in the fridge for a day or two. Take whole eggplant and put on grill on low. 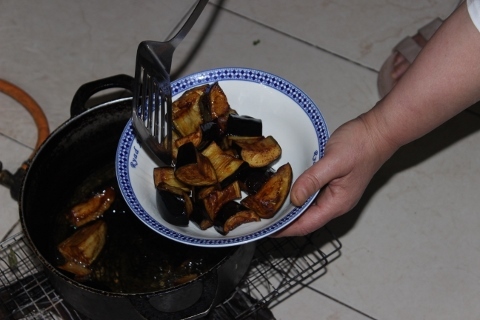 Roast eggplant till soft and skins begin to split open. Scoop eggplant out of the skins. Meanwhile, cut the tomatoes in half and grate them – discarding the skins. Grate or finely chop the garlic. Put tomatoes, garlic, paprika, cumin, pepper, salt, and olive oil into a large frying pan. Cook over medium high heat till all the water is gone and you have a thick tomato sauce. Add eggplant to pan and mix. Add cilantro and mix. Came down to breakfast and were served an entire table full of breads. Croissants, flat bread, French bread, what looked like English muffins. Sigh. Breakfast seems to be the big challenge food allergy wise. Both of us are allergic to wheat and eggs among other things. We’ve had eggs every morning for the past 6 days – because it seemed the least worst option (some allergies being worse than others). But since yesterday Melissa got a terrible tummy ache – most likely from drinking coffee on an empty stomach – but still – time to maybe not eat the eggs this morning. Before booking each and every hotel Melissa had emailed them months ago and asked if they could accommodate the allergies. All the hotels we booked assured us that they could. And she emailed them again a week before we departed to remind them. Alas, our first hotel in Marrakesh seems the only one to really think it through. So Melissa says to the waiter that we can’t eat the breads. She does the google translate thing to French on Dave’s cell phone “allergic to wheat”. Ahhh they say, how about some eggs? They eventually brought some orange slices, tomato slices, and chopped onion. Gonna be stopping for lunch early today. When we went to pack the car, there was a troupe of young grade school age school girls walking past. They yelled out “Bonjour!”. Melissa replied, “Bonjour!” whereupon they started chattering to her in French. What is this? Young girls wanting to talk to the foreigners? Wow. Alas Melissa’s French is no where near good enough. So she says “petite Français, English?”. They continue to chatter at us. Dang. Would really have loved to talk to them and see what they wanted. The drive across the mountains (yes again) takes us into serious fruit tree country. Very pretty and green all around. Passing through one of the forests Dave spots monkeys, but there is no where to pull over and park to take pictures darn it. 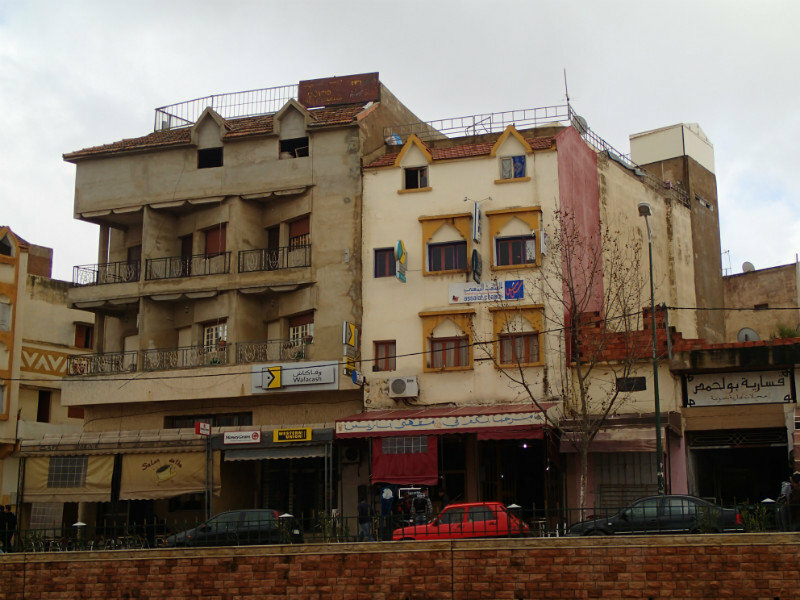 We stop in El Hajeb as google maps shows it lined with tons of cafes. And sure enough we drive down the street and see tons of little places. So we park the car and start to walk back up the street. 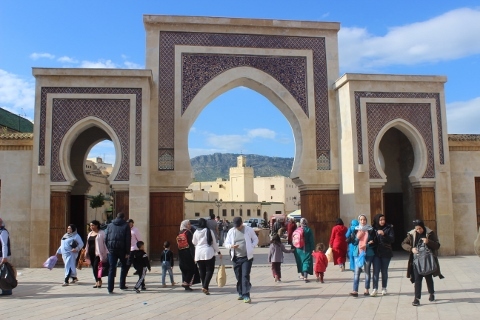 Melissa, emboldened by yesterday’s experience seeing local women without scarves decides to forgo it today figuring the closer we get to the big city of Fes the more accustomed people are going to be with tourists. Maybe not the best of decisions. Very traditional town. And in about 20 cafes we walked past – not a single female in any of them. Tons of men drinking tea or coffee, but not a single female. Lots of women on the street going in and out of shops – but not one in the cafes. And we are getting lots of stares. Ok, yeah, time to exit stage right. We make a U-turn and head back to the car. So much for that early lunch. Melissa didn’t take pictures there, but here’s one from another travel blog. 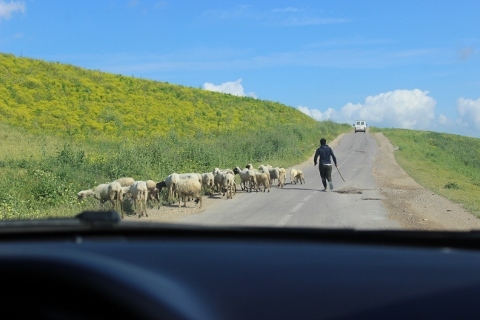 When we reach Fes, we are back in the land of crazy drivers. 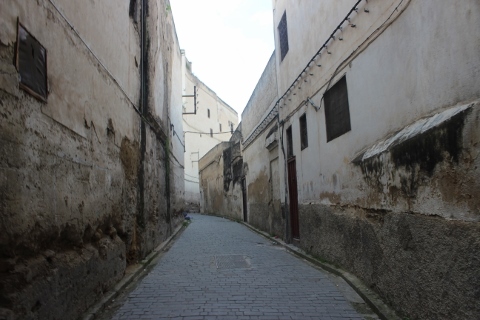 The google maps turn out to be not quite as spot on accurate in Fes and there are lots of small twisted streets so navigation turns out to be a little challenging. A guy on a motorcycle pulls up and wants to talk to us. Oh yeah, here we go again with the “helpful” locals. We try to ignore him. Alas he is insistent and finally Dave relents and rolls down the window to chat at a stop light. At the next light he offers to find us a great place to stay. No we say, no thanks. Next light he insists again, we tell him, “we have reservations”. He continues to follow us till we take a wrong turn and have to back track. Now he’s offering to lead us where we need to go. We tell him no. He says follow me. We take a turn away from him deliberately. He doubles back and chases us down again. Melissa gets pretty annoyed and tells him we are fine and he should go away. He continues to follow us. A second motorcycle appears and Dave thinks he sees the two guys chatting. The first guy finally peels off and the second one closes in and tells us he would be happy to help us. They are working in pairs now? Seriously? We pull over near the hotel and call them as their instructions had been to get near them and call and they would come and show us a secure place to park. We call, and the guy is still banging on the window insisting on “helping”. We continue to ignore him and a few minutes later a very nice lady comes to help us find parking. This was the most obnoxious the scam “helpers” have been to date. Melissa is reminded of what Gavin De Becker says in his book “The Gift of Fear”, to watch out for people who don’t hear the word “no” and go around it – even if their reasoning seems like they are trying to help you. Nice polite people respect boundaries and will back off. Scammers won’t. Don’t let your own politeness get used against you. The gal who runs the Riad Alya here is adorable. Her name is Ahlam. She first takes us to an underground parking spot with a security attendant 24x7 where we will leave the car for a couple of nights. 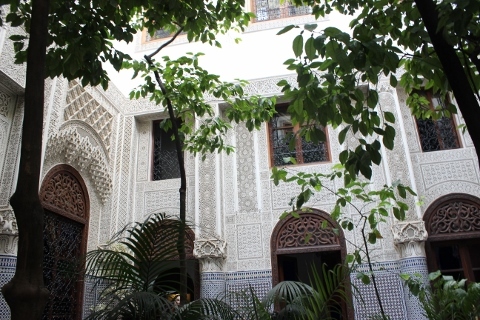 Then back to the Riad where we get mint tea and relax in the lobby. Once we are all checked in, its time for a little tour of the place. Built almost 200 years ago – a lot of the mosaics are original and are spectacular. Ahlam remembers all about the food allergies and a discussion ensues about what she can feed us for breakfast. We ask about sausage and she look at us like we are nuts – “Not at breakfast!” she says. Hmmm. We finally relent and tell her omelets and fruit will be fine. Not ideal as its more eggs, but hey, at least she tried. She then takes us to our room which is enormous. Two sitting areas, one with two big leather chairs and a table, a huge king size bed, and a bathroom that is as big as the bedroom with two sinks, shower, and huge jetted soaking tub. Even has a little fridge. Its 3pm and we are now starving. We drop our stuff and head out. In the reception area Ahlam tells Melissa she looks like a local with her scarf on. But she offers to arrange it properly. So she gets out a pin and redoes the scarf to look truly like a local. 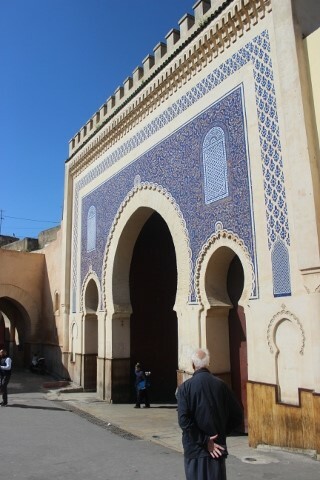 Then she shows us the map and where to go for lunch near the famous blue gate only a few minutes walk from the Riad. We head out and get lunch at a little café and then walk through the marketplace. It’s a bit different than Marrakesh. It has a lot of the same tourist stuff, but its clear that the locals must actually shop here as you see normal clothes – sweaters, jeans and such, along with plumbing supplies, a key maker, you name it. Interestingly the prices of things are lower too. In Marrakesh we negotiated a vendor down to $30 dirham for a scarf. 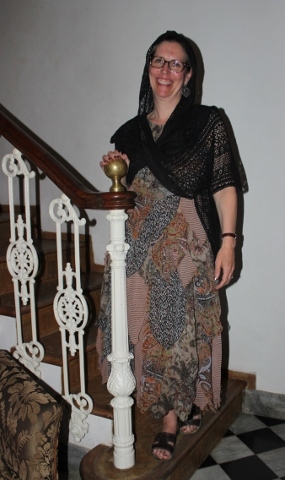 That same scarf – the starting offer was $30 dirham here in Fes. 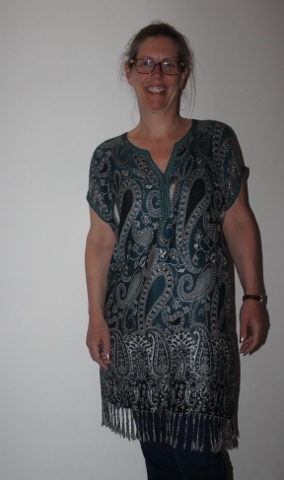 Melissa did want to find a nice tunic. She had seen one she really liked a few days ago but it was too small. So we are on the hunt for one. Melissa stops in one shop and the shop keeper pulls out about 30 of them for her to see. But they are “one size fits no one” and not very good quality. The shop keeper offers them at $90 dirham (about $9 US) So we move on. A few doors down, she spots a nearly identical one to the one she fell in love with. In that shop – upstairs – people are actually sewing – they make everything right there. And the one she wants fits perfectly! Ok, how much? 280 dirham. He goes on about how they make everything themselves and what not. Ok, gotta admit, he was good. We just didn’t want to negotiate as he was so sweet. What’s your best offer? $250 dirham. Yeah, ok.
We continue to wander till we wander outside to a small square. 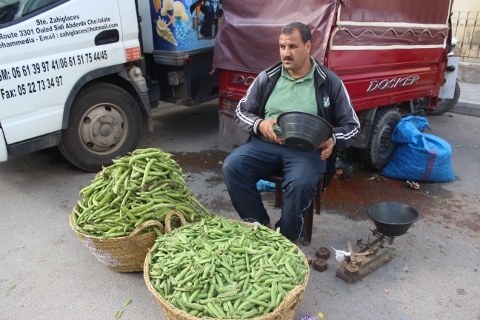 We find a vendor selling sugar peas. We ask how much. 50 cents US for 2 pounds. We tell him yes, we will take some. Back home at Metropolitan market 2 pounds would be $10. We should have negotiated probably, but why? The markets were super crowded and we had about enough for the day, so Dave pulls out his phone to figure out where we are and how to get back to the Riad. We decide to hoof it – though it’s a ways and through the back alleys. Oh well, we like to see the real city anyway. A few locals look at us funny as most tourists don’t wander this way, but we didn’t feel unsafe, just out of place a bit. And the boys immediately start grabbing at the camera. A bit taken aback, Melissa realizes almost immediately that they just want to see their picture. Melissa shows it to them. Then they start demanding money. Oh no way. Melissa laughs and tells them no. They continue to insist. She is like forget it you little thieves in the making. They follow us for several blocks demanding money. We just kept laughing. Then they try to be “helpful” and tell us they will take us where we want to go. Oh no, Melissa says, no dirhams, no way. A few blocks later they wander off. Melissa says to Dave, “you still have your wallet?” “Yeah, already checked.” Sheesh. No way in heck were we giving those kids money. Just encourages them to grow up and be even worse. Dave says, “But you knew that’s what they were after, right?” “Nope. Didn’t even dawn on me till they started asking for the money.” Too many other places we have been where kids just get a kick out of you taking their picture. Later Dave says that he heard the oldest boy in the red shirt – who stuck with us the longest -as he headed back to his friends say, “I got some!”. Guess he had to save face with his pals. We make it back to the Riad and ask for a bottle of rose wine delivered to the roof. We head up there and are happy to sit and eat our peas and drink wine and look at the amazing view of the green countryside and the city below. Melissa having spotted a winery sign earlier in the day asked the waiter if it was possible to go on a Moroccan wine tour and taste the wines. “Oh no!” he says. He goes on to explain that because Morocco is a Muslim country, alcohol has only been legalized in a few places. He implied that the wineries have to get permission to operate from the government. But because it is so anti-culture people worry that the fanatics will bomb the wineries. So they are heavily guarded and no one is allowed into them. Fascinating. Makes us wonder how the wine is distributed to the hotels. Under armed guard? Also interesting that while every hotel we have stayed at has had plenty of wine, each hotel has wine from a different winery – but no choice between wines. They have one and only one red wine and so forth. Will have to figure that out as we would love to take a few bottles home. The wine is surprisingly good for a country that isn’t known for wines. Melissa decides to take a nice soak in the giant jetted tub. Fills it with hot water and gets in. Big electronic control that seems to work, but alas no jets. She calls Dave for help. He comes and goes through the same sequence of punching the buttons. “Sounds like the pump has seized,” he says. MacGyver opens the compartment under the tub and starts to poke around. “Want me to see if I can fix it?” “But you didn’t bring your multi-meter.” “Yeah, that’s true. It was in my backpack but I took it out before we left.” Yes. Those that know Dave can be shocked at this point – we went on a trip without a multi-meter. 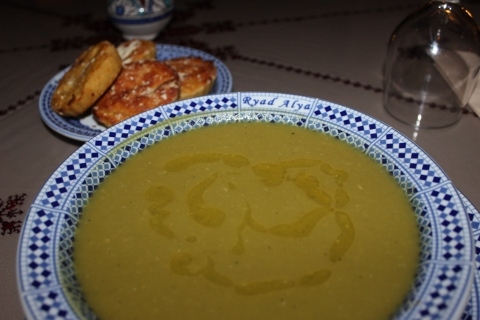 Dinner was split pea soup (is that originally Moroccan? ), all the usual selection of salads, and the kafta meatball tagine. 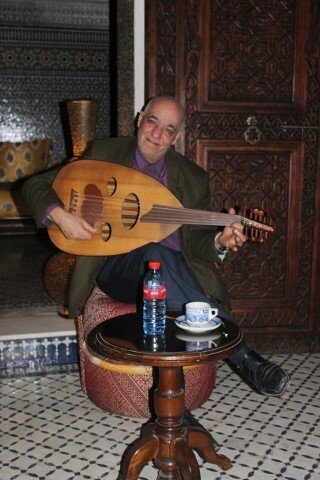 The Riad has live music tonight. After dinner Melissa goes to chat with Ahlam. Melissa wants to know what “Babouche” means because the boys on the street earlier today had asked her if she was Babouche. 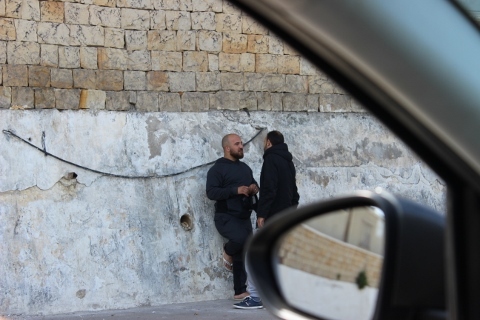 Imagining the boys might have been calling her names, she tells Ahlam she needs to know what a word means and it might be a bad word, she isn’t sure. She says “Babouche” but botches the pronunciation. 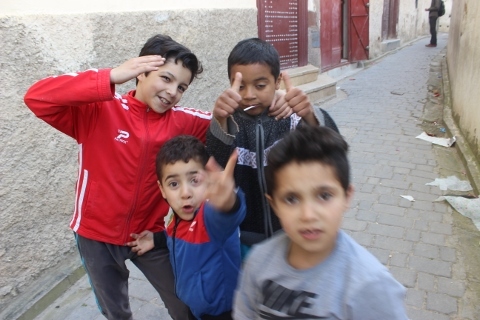 Ahlam laughs, “Its shoes!” Ah, this makes sense – the boys were trying to direct us to the shoe store. 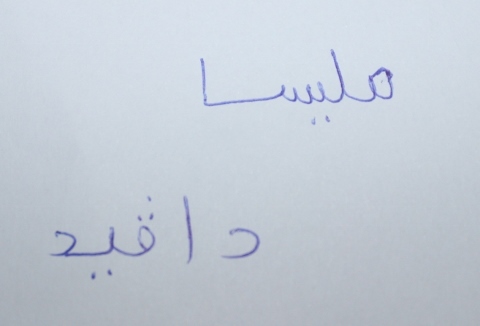 She then writes our names in Arabic. The top one is Melissa and the bottom one is David. We awoke this morning to the cleaning crews sweeping up from yesterday’s sandstorm. The place was a mess – with sand and debris everywhere. 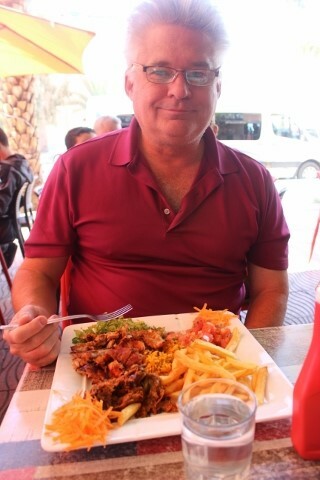 We paid the bill – which came to about $600 US dollars. Pretty cheap in the scheme of things. 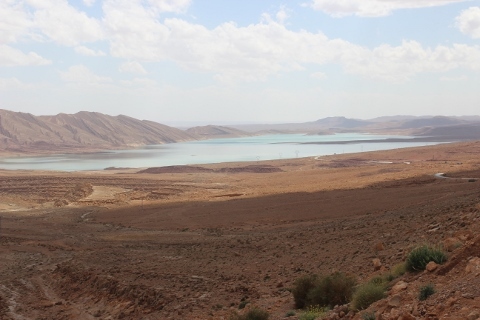 Three nights – two at the hotel and one camel overnighter in the dessert, the trip with Barak in the 4x4, and all our food for three days except the two lunches we ate in town, plus plenty of wine. Time to hit the road again. 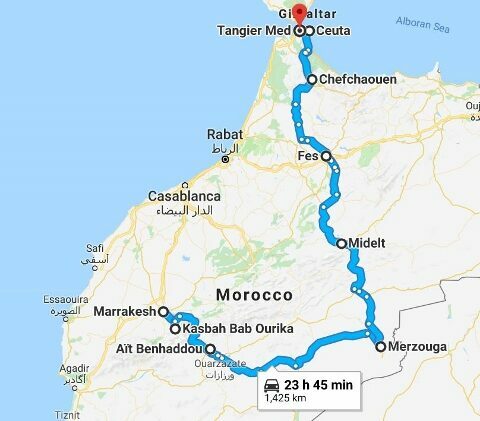 Ultimate destination was Fez, but Google maps indicated that it was an 8-hour drive – which makes for a long day if you want to stop and see things along the way. And blogs we read while trip planning said not to make the drive in the dark. That was a good call because we went over the mountains and the switchbacks would have been nutty in the dark. Hence, we planned to stop mid-way in Midelt. On our way out of town the hotel suggested we stop at the local argan oil shop as they had high quality stuff. Since Melissa wanted more to take home, and was on the hunt for some gifts, we took a look. All we found was cosmetic argan oil. Melissa managed “argan manger” (manger is eat in French) and the shop clerk scurried off to the back and came back with a gallon container of oil and a small glass bottle. $25 US dollars. We probably should have negotiated, but since everything else in the shop was actually marked with prices – we just went with it. Happy to make a contribution to the local economy. We also bought some cosmetic argan and some saffron. Then we needed to fill up with gas. But they don’t take credit cards. And Melissa had nearly spent all the cash Dave had in his wallet at the argan oil shop. Doh. 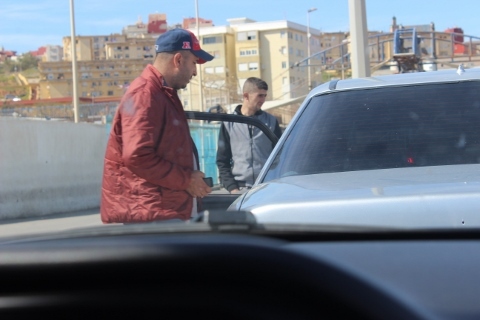 So Dave put $12 US dollars’ worth of diesel in the car – which we figured would get us to Midelt. After a small back and forth with the attendant, where in Dave was convinced he was going to put gasoline rather than diesel in the car – because here diesel is called gasoil. And oddly diesel is cheaper than gasoline here. A few miles down the road Dave says “Doh!”. And Melissa is like “What’s wrong? !” Dave remembered he had a bunch more cash in his back pack. Oh right. Duh. We outwitted ourselves yet again. We always separate some cash so in case Dave gets his wallet stolen we won’t be without any money. And Melissa always puts her wallet in the hotel safe, and then Dave carries his around town. That way if his credit cards are stolen – Melissa will have hers as backup. All part of the schemes we have developed over the years traveling in the third world where you might not be able to get new credit cards FedEx’ed overnight. None the less, we are running low on cash, so we stop on our way through one of the towns to get some cash. Then we stop at another gas station to fill up. Dave pokes his head in the car and asks Melissa if she wants to get the car washed. “YES!” The car is beyond filthy. Between driving through the muddy clay on our way up the Atlas Mountains, and the sandstorm yesterday, the car is looking pretty sad. And the windows are making horrible noises when you roll them up and down because there is now so much sand in the crack between the window and the door frame. So we pull into the car washing area and a young guy proceeds to hand wash the car. First sprays all the mud and sand off. Melissa taps on the window and points to the sand in the window. He grins and her and nods and points the spray right in the crack and powers all the sand out. Then he gets out a bucket of soap and a sponge and washes the car. Sprays it all down again. Then gets a towel and hand dries it. At this point we are wondering what all this effort is going to cost as Dave forgot to negotiate the price in advance. But they charged us a mere $2 US dollars. So worth it. Along the way we saw several Oasis’ where there is an abundance of water at the bottom of a valley resulting in lush green towns. Though it was weird to see a mix of palm trees and pine trees. There’s even a huge reservoir here. At one overlook where we pulled over to take pictures, there was the usual setup of a guy with a table and a ton of fossils. Fake fossils that is. We’ve seen enough of them now to recognize the roughly 20 or 30 varieties of fakes because there just aren’t that many different molds apparently. As we were driving along, we passed through a radar trap, and low and behold – the police officer with the radar was female! Hey! First woman we have seen in any job not cleaning or otherwise menial. Melissa grinned and waved, and she grinned and waved back. Along the way we stopped in a town called Errachidia for lunch at Restaurant Grillades Zerda – a popular spot that Google maps knew by name (typically the more established places). The menu was in French and we were not sure what we wanted, but the table next to us had some tasty looking plates. And from nowhere Melissa managed to remember enough high school French to say, “Qu'est-ce que c'est?” (What is that?) The waiter turned the menu to the right page and pointed. Ok, now we just have to choose a meat. Again we puzzle. Then we spotted the shawarma! Yes! The waiter explained we would have to wait 40 minutes – but we were all in! As we sat there we realized the reason for the wait was that the shawarma wasn’t cooked enough – they had to turn up the heat on it. But that was fine because it was the best people watching yet. Errachidia has a large military base and an airport. It’s not really a tourist town. Melissa was a bit nervous as she wasn’t wearing her scarf on her head. And at one point a very traditional – long bearded man stared at her a bit making her a bit nervous. She tried a smile and he smiled back. Ok, guess it must be all right then. More tourists off loaded from a bus and a lot of them didn’t have scarves. Ok, now she isn’t the only one. And then (amazingly!) a native family came in – looked like professionals – and the wife had no scarf! And then a bit later, some other local women came in without scarves! Wow. First time we have ever seen that! Interesting. We wonder if maybe the military base has something to do with a bit of modernization here? Or maybe in Marrakesh we would have seen a bit of it had we wandered to the more industrial parts of the city? Then a beggar came by. Clearly destitute, dirty, unzipped pants. He gestured holding his hand to his mouth begging for food. The waiter immediately went over to him, and another of the staff came running with a bottle of water. Melissa thought for a moment they were going to offer him something to drink. But no. The waiter started gesturing at him – clearly threatening to splash him in the face with the water to make him go away. Hmmm. Not sure how I feel about that – but it is certainly a way to get rid of people without any real physical harm. Then the food showed up. All this giant plate full for $4 US dollars. And oh so good! There are apparently French fries the world over. There were two types of ketchup. One that was sickly sweet. Would have been more accurate to call it tomato jam. Ingredients were: water, sugar, tomato paste. The other one was spicy hot. Dave mixed them together and they weren’t bad. As we walked back to our car, we saw a man wiping down cars on the street. Sure enough when we reached our car, he came running over to tell us that he cleaned our car while we were gone – obviously looking for some money. We laughed as we just had it cleaned. But Dave gave him 1 dirham (10 cents US) and he seemed thrilled. As we came over the last of the mountains, we spotted men along the road with Coca-Cola bottles filled with something. Dark liquid, but not Coca-Cola. Not argan oil. We puzzled and puzzled. Then Melissa put the pieces together. We kept seeing white wooden boxes everywhere. Hundreds of them across the fields. Bee hives! Honey! As we came across the mountains into the Midelt valley the temperature dropped dramatically. It went from mid 80’s to about 50 degrees. Brrrr. And it was stormy over the mountains and we got rained on. Its almost like being back in Seattle. When we reached Midelt we took a few wrong turns getting to the hotel. Not because the google map was confusing but because Melissa wasn’t paying attention to it. Ooops. 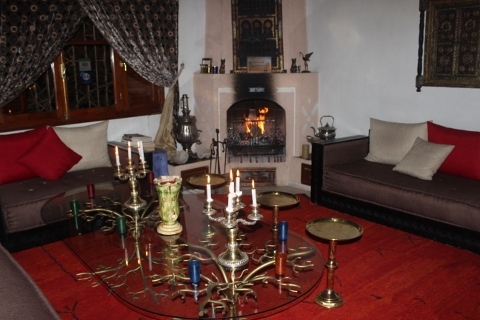 We got to Riad Villa Midelt and found a cozy fire waiting for us in the lobby. We started filling out the paperwork. Hotels here are required to collect your passport info, country of residence, and such. This hotel asked our starting point and destination. We put Marrakesh and Tangier. Ah no, they explained in broken French/English, your destination tomorrow. We said Fez. Ah then your starting point this morning was Merzouga they said. Interesting. So Midelt really is just the stop over point and all they need to know is where you are going to know where you started. After getting settled, Melissa heads downstairs to see if she can dig up a bottle of wine and some glasses. Sure enough – they had plenty on hand – but only red wine. Ok, twist my arm. Really tasty too. Ahhh, and high-speed internet! We can get a good fix! Dinner was chicken skewers and a big pile of salads. What we now know is very traditional. We’ve seen these same exact salads repeatedly. Melissa asked the waiter if the chef would share the recipes, and he said yes. When he left, Dave chuckled, "You know there is no way he understood you, right?" After dinner we flipped on the TV, but everything is in Arabic. So we started watching what looked like a soap opera and making up our own story line to match the action on the screen. Taking turns to build on the story line. Hilarious!